Pretty embarrassing, huh? Yikes. I’m not too proud of that one. The dryer vents through this window, and because of it, this has been a major source of cold air infiltration into our basement. It’s probably looked like this for the past 10 years or more. This is a double window setup. From the inside, this awning-style window doesn’t have any latch or anything keeping it closed. Previous owners have nailed the thing shut (which, I guess, is probably about as secure as a window latch would be). The exterior storm window doesn’t shut either, also to make space for the vent. The result is that there are huge gaps allowing exterior air directly into the basement. I decided that since we’re trying to sell the house and all, that I’d better do something about this. The best way to fix this would be to find a way to vent the dryer directly out the side of the house (as opposed to through the window), but I didn’t want to mess around with that. So I just wanted a way to make this more secure, more energy efficient, and less ugly. And I also wanted it to be easy. This little wooden frame allowed me to screw the vent cap in place from the outside – previously it was just floating around unsecured. Note: if I was doing this over again, I probably would have removed the paper facing from the insulation for about 1″ in all directions around the vent. I don’t think this is really a problem since dryer vents don’t get very hot, but I’d probably do it anyway. So, you know… not exactly the most attractive finished product. There’s nothing stunningly beautiful about a piece of plywood. I am a little sad about losing the window in the basement, but there were enough cobwebs here that not much light was getting in anyway. I consider this a temporary fix – at some point someone (else) should replace this with a proper window (or concrete blocks). But considering this only took me about 2 hours, and only used materials I already had laying around the house, I consider it a big improvement – especially in terms of energy efficiency. No more drafts coming through this window… now the rest of the windows…. well that’s a post for another day. Another busy weekend around the Collins household. In addition to plugging our way through Buffy The Vampire Slayer Season 2, we went tubing on Saturday and I now I look like a lobster because I’m too lazy to wear sunscreen. Serves me right. I even had sunscreen. And I stood around for 5 minutes while everyone else applied their sunscreen. In the moment, I just decide that I’d rather deal with being burned for the next week than take the time to wear sunscreen. Something’s off on that cost/benefit analysis…. QUERY: How did you secure the wood framing to the foundation blocks? ANSWER: I didn’t. Let’s just say that there was a tire jack involved in the installation process and that those pieces are wedged in there as tight enough that they aren’t coming out easily. Anywyay, there’s still a lot to be done here. 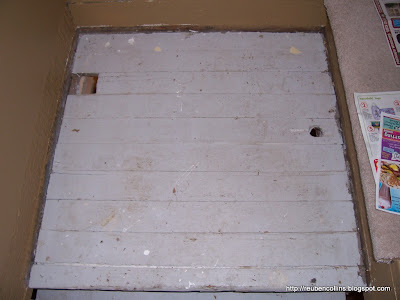 I still have to caulk all the edges, and there’s some mortaring that will need to be done around the gaps (spray foam?). I’m still trying to decide if I’m going to add some wood molding around the edges, or if I’m just gonna mortar the thing in place. Well I haven’t made much progress lately on the last home project I started and never finished, so that means it’s about time to start a new one! I mentioned back in February that my basement windows were in extreme need of replacement, so between episodes of Buffy the Vampire Slayer (which I’m just now watching for the first time), I decided to investigate the situation a little more. Lot’s of cobwebs in here since the space between the two windows hasn’t been opened in decades. Next, I started the old “screwdriver test” where you start jabbing at the wood with a screwdriver. In solid wood, you shouldn’t be able to press the screwdriver into the wood. If the wood is rotten, a screwdriver will push right into it. How far the screwdriver goes will tell you how rotten the wood is. The screwdriver sunk all the way in with no trouble at all. I kept digging a little bit and discovered that the entire bottom sill here is total garbage. 1. I discovered that my foundation is constructed out of hollow blocks. Should I fill them somehow while I’ve got the window out? If so, with what? concrete? spray foam? dirt? gravel? 2. After I rip the old wood out, I’ll have nothing left but concrete blocks. When I put the new wood in place, how am I supposed to secure it to the foundation? Or do I just kind of wedge the four sides in place and call it good enough? 3. When I install the window, should I re-install the storm window as well? Or should I just go with a single window system? With the warmer weather coming these days, I’m starting to look forward to a few new house projects coming down the pipeline. First, I guess, I need to finish up the old projects. 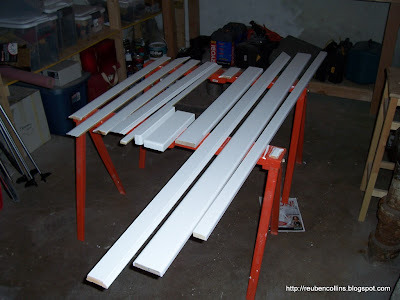 Here’s a photo of some trim pieces in my basement – all painted, cut to size, and ready to be installed. This is some decorative trim that we will install in the stairwell down to the basement. We started this project about a year ago. Finally, another few hours of work and this project will be finished. It might be kind of hard to tell, but the three 2×4’s supporting this platform are pretty random. There are a lot of little chunks of wood all nailed to each other with no specific pattern or method. Also, it’s not really clear to me what’s supporting the top of the stair stringers, so I’m probably going to try and figure that out as long as I’ve got the platform out of the way. Anyway, this will sort of be one of those projects that I won’t know how involved it will be until it’s too late to turn back. I also want to replace the three basement windows (which I wrote about here). Anyway, it doesn’t sound like much, but I expect it will keep us pretty busy all summer. Wish us luck! I’m starting to look forward to the next home improvement project, which will probably be replacing three small windows in the basement. The current windows are basically inoperable. The two that are currently closed won’t open, and the one thats currently open won’t shut. It may be a tricky project, though, because the reason two of the windows won’t open is because they’re currently helping to hold up my saggy old home! So I could really use some advice from the great wise interwebs about how to approach this project. If you’ve got any tips, I’d appreciate if you let me know in the comments. Now, before we go hating on the peeps that constructed my house back in 1905, we should remember that nearly every home in South MPLS was constructed the same way. If you live in South MPLS, head down to your basement and see if you can recognize the something similar. 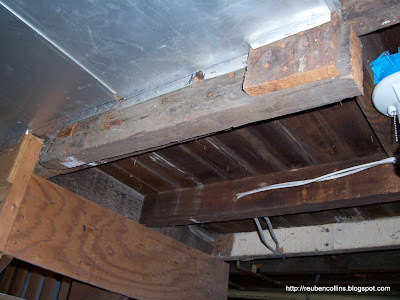 Also, total sag after 100 years is only about a 1/4″ – not exactly critical… the rest of the house is WAY more wonky than these joists…. 2. When I replace the windows, do y’all think I should try to jack the sagging sill plate back up into it’s original location, or should I just embrace the sag and try to support it where it currently is? My biggest worry about lifting it back up into place is that doing so would probably cause lots of problems elsewhere (cracking walls, doors that won’t shut, windows that won’t slide very well, etc.) I’m not sure it’s worth it, especially since Mel and I aren’t planning on living here forever – at some point we’ll be moving on to bigger and better homes. 3. I’m not entirely clear on exactly how the old window framing is constructed. If you’ve got any experience with how these things were constructed, I’d appreciate you sharing your knowledge with me. For example, the piece of the window frame immediately beneath the sill plate – how far back on each side of the window does that thing extend? Do y’all think that’s something that should be removed with the window? Or is it embedded far enough back into the foundation on each side of the window that I’m better off just leaving it in place? Or should I cut it off on each side? 4. 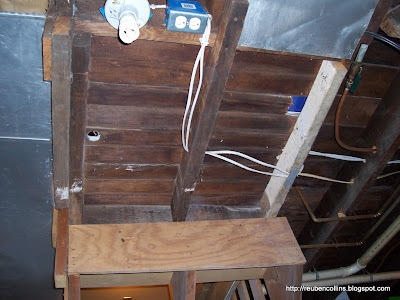 You may notice in a couple of the photos (especially the last one) that there are concrete wedges on top of the sill plate between the floor joists. Any idea what this is? It’s actually a mound of dirt piled on top of the sill plate covered in a sheet of concrete. What the heck is this all about? Was this just an early version of spray foam trying to insulate that space? 5. Finally, when I install the new windows, do you guys think I should stick with the combo storm window / interior window setup I’ve currently got? Or is a single, newer window going to be good enough? I really like the idea of being able to open these windows. Now if that dryer duct through the window isn’t classy, I don’t know what is. The duct tape falling off just adds a special something. Observant readers will notice that sagging is not a problem with the sill plate above this window since the window is parallel to the floor joists, and is thus not supporting any weight. Also, a related project will be re-routing that dryer duct so that it’s not venting through the window. And yes, freezing cold air is gushing through this window as well….